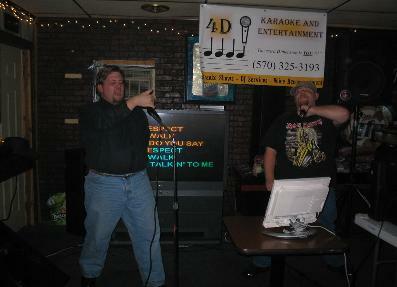 Our karaoke songs are ORIGINAL CD-G discs we purchased online, not bootlegged, stolen, borrowed, or shared. Better than 80% of the songs are from "Sound Choice", which is known for their professional music renditions from original artists. 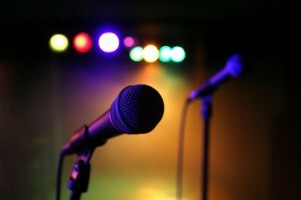 We also have a variety of other karaoke song manufacturers. 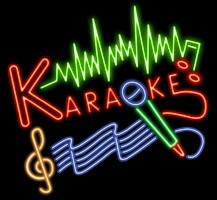 We now have over 12,000 different karaoke songs covering all genres of music. 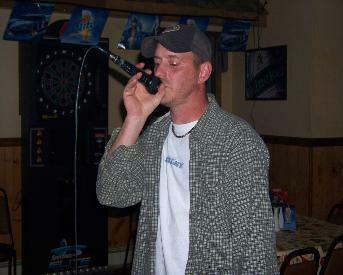 We now purchase updated karaoke music every month to stay current on new releases. 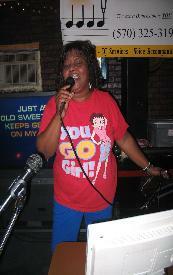 Our karaoke music books, which are viewed by those attending a show, do not have repeat titles in them. Additions are incorporated into a completely new version songbook at the beginning of the year. We have both "Songs by Title" and "Songs by Artists" karaoke books. DJ Daphne working the crowd at Ruby's Saloon, Lehighton.